Draft: 2005, Washington Nationals, 6th rd. Marco Rene Estrada…graduated from Sylmar (CA) High School…attended Glendale Community College before transferring to Long Beach State University. (.333)… his opponents batting average included a mark of .231 (56-for-242) against left-handed hitters compared to .306 (99-for-324) against right-handers…his career splits are .219 (487-for2227) against lefties, .254 (615-for-2419) against righties…yielded a .311 average with runners in scoring position…was 4-7 with a 4.72 ERA in 17 starts before the All-Star Break…then went 3-7 with a 7.17 ERA in 11 starts after the break…posted a mark of 4-4 and a 4.55 ERA in 11 starts on four days rest…was 3-10 with a 6.40 ERA in his other 17 starts…had a .252 opponents batting average the first two times through the lineup, .349 after that…held the number one hitter in the batting order to a .159 average but the three-hitter batted .417…was 2-3 with a 4.40 ERA in eight starts during the day, 5-11 with a 6.17 ERA in 20 starts at night…compiled a 2-5 record and a 4.43 ERA in eight starts against AL West competition, 5-9 with a 6.18 ERA in 20 starts against all other teams…was 1-2 with an 8.78 ERA in four interleague starts…the Blue Jays were 5-2 in his no decisions and had a 12-16 (.429) record in his starting assignments. with three other pitchers on a three-hit shutout in a 2-0 win over Washington on June 16…tossed 6.2 innings and allowed all three of the hits while logging a season-high 109 pitches…had his best month in June when he was 2-1 with a 2.35 ERA and .207 opponents batting average in five starts…the ERA and opponents batting average were 10th lowest in the AL…lasted 0.1 innings on July 3 against New York (NL) before exiting the game with left hip soreness…it was the shortest start of his career…was placed on the 10-day disabled list July 10 with a left glute strain…was sent to Triple-A Buffalo for a rehab assignment July 24 at Louisville and took the loss (3.1 ip, 3 h, 3 r, 3 er, 2 bb, 3 so)…left the game with a right middle finger blister but was reinstated from the DL July 30…tossed 4.0 innings in a 10-1 loss at Oakland that day and did not strikeout a batter for the first time in his career as a starter…allowed one run on one hit in a season-high tying 7.0 innings in his next start Aug. 4 at Seattle…then went 2-6 with a 7.95 ERA over his final nine starts… matched his season high with four walks Aug. 26 in an 8-3 loss to Philadelphia…that began a season-ending and career-high tying five-game losing streak…the streak spanned six starts, during which he compiled a 9.12 ERA (26 er in 25.2 ip) and .336 (38-for-113) opponents batting average…had a 3-2 record in August despite a 6.15 ERA…then went 0-4 with a 7.99 ERA in five starts in September…tied for third in the AL in losses in September…it was his second four-loss month of the season and the third of his career (June, 2017)…allowed a career-high tying eight runs in 2.2 innings in an 11-0 loss at New York (AL) on Sept. 14 (also May 5, 2013 vs. St. Louis and Sept. 27, 2017 at Boston). Posted career highs in starts (33), innings (186.0), hits (186), home runs (31), ER (103), walks (71) and strikeouts (176) ... Threw his changeup 31.9% of the time, the 2nd most in the Majors (Jason Vargas - 32.8%) ... Held a groundball percentage of 30.7%, the lowest in MLB ... Allowed 84 extra-base hits which was the 3rd most in the Majors (Rick Porcello-95, Ricky Nolasco-88) ... Was the Opening Day starter for the 1st time in his career on April 3 at BAL ... Allowed three home runs on April 9 at TB, all on changeups and in either a 0-2 or 1-2 count ... Threw 6+ innings in nine of his first 11 starts, including nine in a row from April 15-May 27 (did so just once over his next 10 starts) ... Pitched consecutive scoreless starts for the 3rd time in his career on April 15 vs. BAL and April 20 vs. BOS (13.0 IP) ... Had his scoreless streak at home snapped after 13.1 IP on May 11 vs. SEA ... Tied a career high with 12 strikeouts on May 21 at BAL (also June 26, 2012 at CIN), his first game with 10+ SO since June 24, 2015 at TB ... Gave up a HR on the first pitch of the game on May 27 vs. TEX (Shin-Soo Choo), the 1st time in his career to allow such a HR... The last time that happened to a Blue Jay was Brandon Morrow on Aug. 28, 2011 vs. TB (Desmond Jennings) ... Had a streak of 12 straight starts without a win from June 1-Aug. 5 (0-5, 7.39 ERA) ... Allowed seven runs over 3.2 innings on June 1 vs. NYY, the first time he allowed 7ER since June 20, 2014 at COL ... Threw a season-high 117 pitches on June 24 at KC over 7.0 innings, his longest outing since May 1 at NYY ... Walked a career-high seven batters on June 30 vs. BOS (4.1IP) ... Pitched 7+ innings in three consecutive outings from July 31- Aug. 10 (21.0 IP, 4ER, 6BB, 18K) ... On Sept. 5 at BOS, threw 7.0 scoreless innings (3H, 3BB, 3K), his 4th scoreless start in 2017 ... Won a career-best 5th straight decision on Sept. 22 vs. NYY...From Sept. 5-22 (four starts) had allowed just 13 hits for a .141 opp. avg. and a 1.67 ERA (5 ER/27.0 IP) ... Match a career-high with eight runs allowed in his final start of the season on Sept. 27 at BOS (2.1IP, 7ER, 9H, HR, BB, 2K). worked 8.0+IP this season & 2nd time during this postseason (last: GM 1 of LDS vs. TEX - 8.1 IP) ...Joined Jack Morris as the only Blue Jays with a postseason CG, both losses...Earned the win in Game 1 of the LDS at Texas... Took a shutout into the 9th before allowing a leadoff triple to Andrus who would score on a groundout... Finished with 8.1 innings of four-hit ball....Became the first pitcher in club history to strikeout the first five batters of a game Sept. 14 vs. TB...Allowed a career-high 10 hits (2nd time) and season-high 6ER in an 8-2 loss, Aug. 24 vs. LAA...Was the first time to allow more than 2ER at home in 2016 and most since June 15, 2014 vs. CIN (span of 26 starts)…Gave up 22 hits over three starts from Aug. 9-24 (14 innings), the most he allowed in any three start stretch as a Blue Jay... Despite a 12-6 team win at NYY on Aug. 16, allowed 5ER & 3HR over 4.0 IP... Was only the 2nd time in his then 49 starts with TOR that he allowed 3-HR in a start (both at NYY, last: Sept. 12, 2015)...The 5ER snapped a streak of 13 consecutive starts with 3ER or less...Activated from the 15-day DL on July 22...On that day had his streak of 13 straight games with five hits or less allowed snapped...The seven hits allowed were his most given up since April 16 at BOS (8)...Suffered his second consecutive loss despite surrendering only two earned runs over 6.0 IP...Hit his first batter since Oct. 3, 2015 at TB...Would later hit a second batter, marking the first time to hit multiple batters in his career...Named to his first ever All-Star Game on July 5...Did not participate in the game due to being placed on the 15-day disabled list on July 6 (retro to July 3) with back discomfort....Had his MLB record of 12 consecutive starts in which he held opponents to five hits or less, while recording 6+ innings snapped July 2 after labouring through 5.0 IP...Would later be placed on the DL due to back discomfort...Extended his streak to 12 consecutive games in which he gave up five hits or fewer, while tossing at least 6.0 innings on June 27 at COL.... Became the first pitcher in MLB history to record 11 consecutive starts allowing five hits or less with at least 6.0 IP of work June 21 vs. ARI (previous was 10 shared by Jake Arrieta-2014, Johnny Cueto-2013-14 & Johan Santana-2004) ....Carried no-hitters into the 8th inning in consecutive starts on June 19, 2015 vs. Bal and June 24, 2015 at TB... Became the 1st pitcher to take a no hitter into the 8th in consecutive starts since Dave Stieb (TOR) on Sept. 24-30, 1988...On June 5 held the Red Sox hitless into the 8th inning before allowing a one-out solo homer to Chris Young after retiring 20 consecutive batters faced...Became the first Jays starting pitcher to throw at least 8.0 IP and allow no more than 2 runs at Fenway Park since Roy Halladay on Sept. 30, 2009...Was the 3rd time in his then last 31 starts to take a no-hitter into the 8th inning...Defeated the Yankees on May 30 (4-2) with eight shutout innings...Limited them to three hits, becoming the 2nd Blue Jays pitcher ever to beat the Yankees twice in a five-day span, matching Dave Stieb in 1982....Made his 100th career start on April 10 vs. BOS - season debut (won, 7.0 IP, 0ER)...Began the season on the 15-day DL (back soreness)...Returned from the DL on April 10. Made a career-high 28 starts, surpassing the 23 made in 2012 for Milwaukee...Made five relief appearances before moving into the rotation on May 5. • His .203 opponents' average led the AL, ahead of Dallas Keuchel at .217, while ranking 4th in MLB...Limited the opposition to a .183 average following the All-Star break, also 1st in MLB. • Posted a .217 BABIP, .015 better than runner-up Zack Greinke for the best figure in MLB...The .217 BABIP is the best total in the Majors since Jeff Robinson posted a .209 figure for the Tigers in 1988. • Went 12-5 with a 2.92 ERA (3rd in AL) in 23 starts following June 1...The 12 wins ranked 3rd (David Price-14) in the AL over that span. • Once settled in the rotation posted a 2.62 ERA in his final 20 starts with a .183 opponents' average...In fact over his last 12 starts held opponents to 2ER or less in nine and 3ER or less in 11, also producing two outings without allowing any runs. • Did not allow more than 2ER over his last nine starts at Rogers Centre...Over that span posted a 5-2 record with a 2.32 ERA and a .151 opponents' average. • Allowed 4H or fewer in 14 starts and 5H or less in 18 starts. • Set career-highs in pitches over two consecutive starts (6/19-24), totalling 247. • Made five appearance (three starts) vs. TB in 2015 without allowing a run until his last outing..Posted 21 scoreless innings before finishing with just 2ER allowed in 27.2 innings (0.65 ERA). • After allowing an MLB leading 29 home runs in 2014 over 150.2 IP finished T23rd this season with 24 HR in 181.0 IP. • Prior to his first start had allowed only one earned run over his last 15 appearances, a span of 27.0 IP (0.33 ERA) dating back to last season...Held opposing hitters to just a .114 average over that span (10-for-88) while fanning 26. • Used his changeup 28.1% of the time, 3rd most in MLB behind only Jake Odorizzi (30.0%) and John Danks (28.9%). • Over his last seven road starts posted a 3-1 record with a 2.60 ERA and a .179 opponents' average. • Carried no-hitters into the 8th inning in consecutive starts on June 19 vs. BAL and June 24 at TB. • In his start on June 19 vs. BAL surrendered a single to J. Paredes to lead off the 8th…Marked the 2nd time (3rd came on June 24 at TB) in his career to work at least 7.0 IP while allowing just one hit. • Didn't allow a baserunner until Logan Forsythe's infield single with one out in the 8th inning at TB on June 24…Had a nohitter broken up in the 8th inning in his previous start, (June 19 vs. BAL)…Became the 1st pitcher to take a no-hitter into the 8th in consecutive starts since Dave Stieb (TOR) on Sept. 24-30, 1988…Reached double-digit SO for the 5th time in his career, 1st with TOR…Only other pitchers in club history with 10+SO, 0-BB & 2H or less are Roy Halladay (May 29, 2005 vs. MIN), Roger Clemens (Sept. 7, 1997 vs. TEX) & Dave Stieb (Aug 4, 1989 vs. NYY)…Threw a career-high 129 pitches, most in the ML since A.J. Burnett on July 23, 2014 vs. SF (131) & most by a Blue Jay since Brandon Morrow on Aug 8, 2010 vs. TB (137), when he was one from a no-hitter. • Made his first career postseason start in game three of the ALDS, allowing one run over 6.1 innings pitched…Became the 9th Toronto starter in postseason history to work that many innings while allowing one earned run or less and only the second to do so without issuing a walk…The only other Blue Jays pitcher to throw that many innings without walking a batter was Jimmy Key in game four of the 1992 World Series vs. ATL. • In that outing vs. TEX, LHH missed on 10 of 22 swings (45.5%), representing his highest single-game miss percentage in two years (minimum 10 LHH faced). • Among starters this postseason, ranked 1st with a 2.33 ERA (minimum 15.0 IP) and 3rd with a .194 opponents' average. • In Blue Jays history, his 2.33 ERA is the 2nd lowest ERA in the postseason behind Juan Guzman's mark of 1.71 set in 1992…Also ranks 2nd in opposition average (.194) behind Dave Stieb's .159 which was set in 1985. • Became the first Blue Jays starter to throw 7.0 consecutive scoreless innings in a postseason game since Jimmy Key in game four of the 1992 World Series. Made his first 18 appearances of the season as a starter, going 7-6 with a 4.96 ERA. The team went 9-9 in his starts, recording nine quality starts. Was moved to the bullpen after the July 11 promotion of Jimmy Nelson. Allowed a Major League-leading 29 HR (27 as a starter). Made his final 21 appearances of the season in relief, posting a 2.89 ERA (43.2 IP, 2HR, 14ER). Went unscored upon over his last nine outings (16.1 IP). Prior to this season had not pitched in relief since July 8, 2012 at Houston (54 straight starts). Went 7-4 with a 3.87 ERA in 21 starts...Produced 12 quality starts.....the team went 12-9 in his starts...Was the victim of 5 blown saves for the second straight season...Went just 2-2 with a 6.62 ERA in 9 home starts (50.1ip, 37er) but was 5-2 with a 2.09 ERA in 12 road starts (77.2ip, 18er)...Was on the 15-day disabled list from 6/5-8/6 with a strained left hamstring, retroactive to 6/4...Was 4-4 with a 5.32 ERA in 12 starts prior to going on the disabled list (69.1ip, 41er) and 3-0 with a 2.15 ERA in 9 starts after coming off (58.2ip, 14er)...Was voted Brewers Pitcher of the Month for August (5gs, 2-0, 2.61era, 31ip, 4bb, 29k)...Was voted Brewers Pitcher of the Month for September (4gs, 1-0, 1.63era, 27.2ip, 7bb, 27k)...Struck out a season-high 9 batters, the most by a Brewer in 2013, over 7.0 shutout innings in a 3-1 win on 8/25 at Cincinnati...Participated in the World Baseball Classic for Team Mexico.....took a 10-3 loss in his only start in the WBC on 3/9 vs. Team Canada (3ip, 7h, 4r, 4er, 0bb, 2k, 1wp)...Signed a 1-year contract on 1/17/14, avoiding arbitration. Spent most of the season at Triple-A Syracuse, where he went 9-5 with a 3.63 ERA in 27 games (25 starts)...Ranked ninth in the International League in ERA...Earned a September promotion to Washington and went 0-1 with a 6.14 ERA in 4 games (1 start) with the Nats...Made his first Major League start on 9/12 at Florida and took an 11-3 loss (2.1 IP, 3 H, 5 R, 5 ER, 3 BB, 4 K, 1 HR)...Was moved to the bullpen and did not allow an earned run in his 3 appearances (5 IP, 1 R). The 4th member of the Nationals' initial 2005 draft class to reach the big leagues (Ryan Zimmerman, Justin Maxwell,John Lannan)...the 5th Mexican-born Washington National...was preceded by Luis Ayala (2005-08), Vinny Castilla(2005), Esteban Loaiza (2005) and Antonio Osuna (2005)...although born in Sonora, Mexico, grew up in SouthernCalifornia. 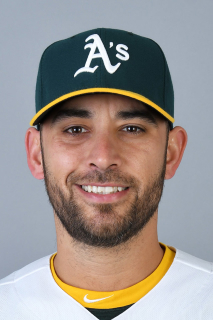 April 17, 2019 Oakland Athletics placed RHP Marco Estrada on the 10-day injured list. Lumbar strain. January 25, 2019 Oakland Athletics signed free agent RHP Marco Estrada. October 29, 2018 RHP Marco Estrada elected free agency. July 30, 2018 Toronto Blue Jays activated RHP Marco Estrada. July 24, 2018 Toronto Blue Jays sent RHP Marco Estrada on a rehab assignment to Buffalo Bisons. July 13, 2018 Toronto Blue Jays placed RHP Marco Estrada on the 10-day disabled list. Left gluteus strain. July 22, 2016 Toronto Blue Jays activated RHP Marco Estrada from the 15-day disabled list. July 6, 2016 Toronto Blue Jays placed RHP Marco Estrada on the 15-day disabled list retroactive to July 3, 2016. Back injury. April 10, 2016 Toronto Blue Jays activated RHP Marco Estrada from the 15-day disabled list. November 13, 2015 Toronto Blue Jays signed free agent RHP Marco Estrada. November 2, 2015 RHP Marco Estrada elected free agency. August 7, 2013 Milwaukee Brewers activated RHP Marco Estrada from the 15-day disabled list. August 2, 2013 Milwaukee Brewers sent RHP Marco Estrada on a rehab assignment to Nashville Sounds. July 29, 2013 Milwaukee Brewers sent RHP Marco Estrada on a rehab assignment to AZL Brewers. June 23, 2013 Milwaukee Brewers sent RHP Marco Estrada on a rehab assignment to Wisconsin Timber Rattlers. June 5, 2013 Milwaukee Brewers placed RHP Marco Estrada on the 15-day disabled list retroactive to June 4, 2013. Left hamstring strain. June 26, 2012 Milwaukee Brewers activated RHP Marco Estrada from the 15-day disabled list. June 16, 2012 sent RHP Marco Estrada on a rehab assignment to Nashville Sounds. May 24, 2012 Milwaukee Brewers placed RHP Marco Estrada on the 15-day disabled list. Right quadriceps strain. April 6, 2011 Milwaukee Brewers selected the contract of RHP Marco Estrada from Nashville Sounds. March 1, 2011 RHP Marco Estrada assigned to Milwaukee Brewers. October 8, 2010 Milwaukee Brewers sent Marco Estrada outright to Nashville Sounds. June 1, 2010 Milwaukee Brewers optioned Marco Estrada to Nashville Sounds. May 18, 2010 Milwaukee Brewers recalled Marco Estrada from Nashville Sounds. April 4, 2010 Milwaukee Brewers optioned Marco Estrada to Nashville Sounds. February 3, 2010 Milwaukee Brewers claimed Marco Estrada off waivers from Washington Nationals. January 28, 2010 Washington Nationals designated RHP Marco Estrada for assignment. September 8, 2009 Washington Nationals recalled Marco Estrada from Syracuse Chiefs. July 20, 2009 Marco Estrada roster status changed by Syracuse Chiefs. July 8, 2009 Syracuse Chiefs placed RHP Marco Estrada on the 7-day disabled list.